The latest National Weather Service reports for the Barrington area suggest the borough and neighboring communities could see more than 4 inches of rain from Sunday through the end of the day Monday, along with wind gusting up to nearly 50 mph. 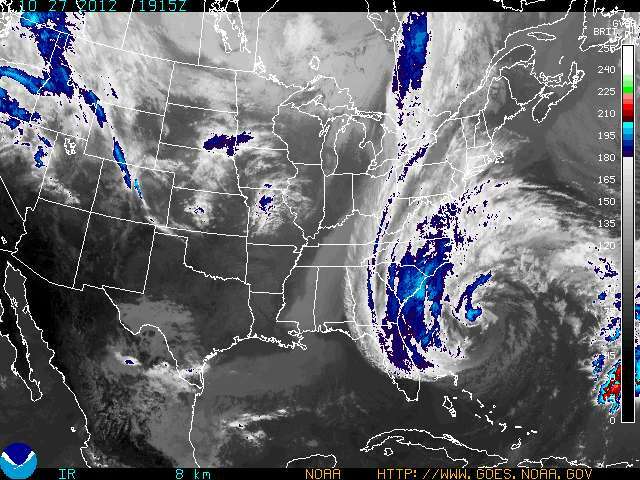 The weather service has issued a flood watch, high wind advisory, coastal flooding advisory and hazardous weather outlook for the region as the remnants of Hurricane Sandy bear down on New Jersey. The possible path of the storm still is not certain, so these forecasts still may change. Tuesday: Rain. The rain could be heavy at times. High near 53. Very windy. Chance of precipitation is 80%. Tuesday Night: A chance of showers. Mostly cloudy, with a low around 44. Windy. Chance of precipitation is 50%. This entry was posted on October 27, 2012 by Barrington Bulletin in Region, Safety and tagged hurricane sandy, storm.